I like to float around in easy, breezy sundresses all summer long. I also like to wear my hair short and laugh really loud at silly jokes. Finally, I like to eat ice cream by the gallon while squeezing my eyes really tight and imagining I’m on a Caribbean island. This is best done while nibbling on a cold spoonful of creamy coconut ice cream, made even sweeter by the fact that I didn’t have to turn on the stove – not even for one second – to make it. Call me a glutton for punishment, but I think this ice cream should be served with warm Baked Brown Sugar Bananas, another wonderful Caribbean treat. 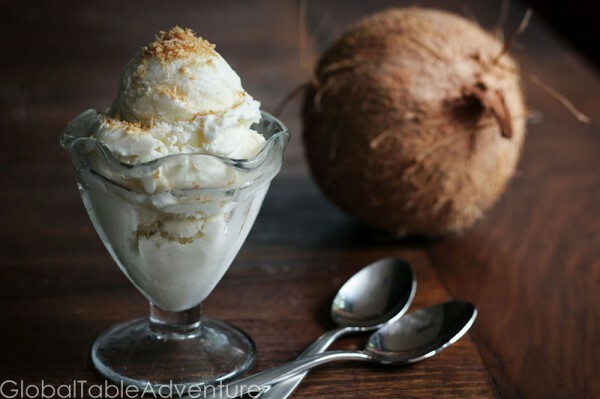 Before we get started, let’s give a nod to how coconut ice cream is traditionally made in the Caribbean. 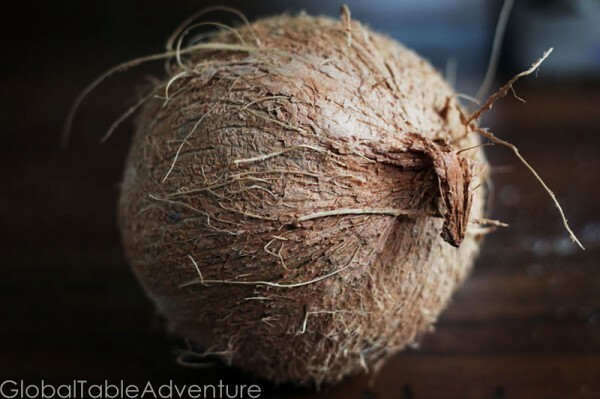 First, a beautiful coconut would be hacked open and shredded for deeply rich coconut ice cream. I couldn’t even figure out how to get this thing open without a hammer and nail, so we’re going with something a little more cosmopolitan. And quicker. 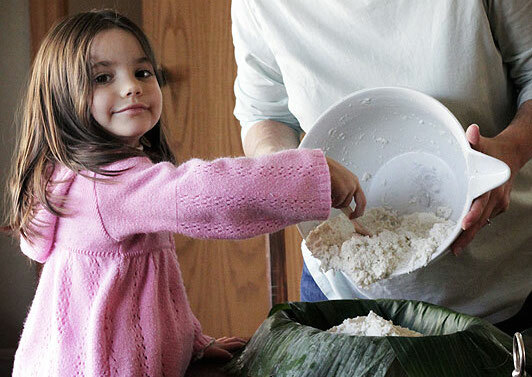 Today’s recipe has all the big flavor of fresh coconut, but with three simple ingredients. 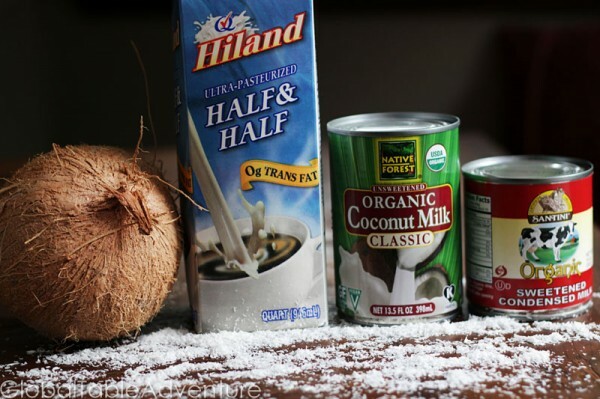 All you need are half and half, coconut milk, and sweetened condensed milk. No hammer or nail required. Whisk the ingredients together, then pour into ice cream maker and churn according to manufacturers instructions. Put it in the freezer to harden up all the way. When you’re ready to eat it, set it out at room temperature for a few minutes before scooping. Top with toasted, shredded coconut if desired. Share with a friend. Eat with a smile. Possibly in a coconut bowl. Or you could wear the coconut halves. That might be interesting. 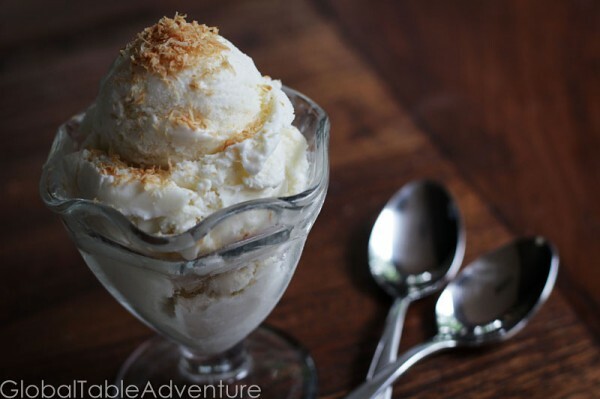 Either way, sit back in amazement at how ridiculously easy it is to make coconut ice cream. Holy cow this is good! I added 1/2 tsp rum extract for added flavor. My sister is volunteering in Haiti for a year and I made it for her bon voyage dinner. You’re probably going to think I’m crazy but try this caribbean ice cream with ginger added in! Honestly, just try it! Previous PostThere’s *what* in my drink?